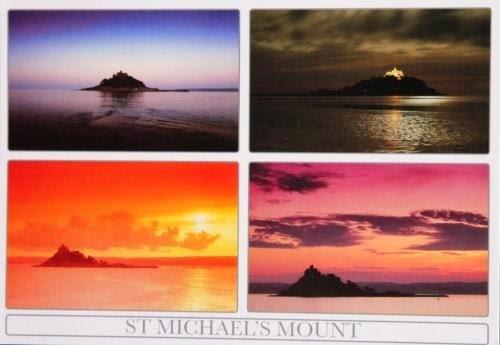 Postcard GB-537114 from UK shows St Michael's Mount, a tidal island off the Mount's Bay coast of Cornwall, England, United Kingdom. The island's history can be traced back thousands of years ago as a busy trading port in Europe. According to Wikepedia, St Michael's Mount was a Cornish counterpart of Mont Saint-Michel in Normandy, France, given to the Benedictines, religious order of Mont Saint-Michel by Edward the Confessor in the 11th century. It became a major destination for pilgrims. In 1659, St Michael’s Mount was purchased by Colonel John St Aubyn, the last military governor of the island’s garrison. It became his private home and his descendants are still live there today. The Mount was gifted to the National Trust in 1954. 366 meters or 1200 feet across the town of Marazion, St Michael's Mount is one of the 43 unbridged tidal islands that can be walked to and from mainland Britain, by a man-made causeway.